Author: Beatrix Heintze. Series edited by: Beatrix Heintze. 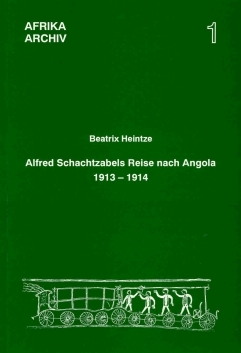 Alfred Schachtzabel’s expedition to Central Angola during the years 1913–1914 was aimed above all at collecting ethnographic books and studies for the Berliner Völkerkundemuseum (Berlin’s Museum of Ethnology, Germany). Unfortunately, more than three fourth of his material objects and records got lost during World Wars I and II. Until now, the results of his research have been published in popularized form only. This book’s “integrated source edition” takes up the ethnographical and geographical parts of the expedition report published by Schachtzabel and adds a scientific treatment of all original sources available which have not been published hitherto and seem relevant in this context. These include additional anthropological and linguistic information and above all a catalogue of Schachtzabel’s collection in Berlin, containing photographs of the objects if they were available. Schachtzabel’s objects being documented in their scholarly context are thus also accessible to Angolans (even though only in German for the time being), these collections, photographs and records of the expedition being part of their cultural heritage. By dint of long hours of work Heintze has produced a very valuable account which may approximate Schachtzabel's original vision of the whole but not his goals. What it certainly does is to rescue information about the Ngangela and, to a lesser extent, the Cokwe that otherwise would effectively remain lost. The result is very much a reference work, a kind of ethnographic survey, but one that obviates the most palpable defects of that genre because the unity of time, space, authorship, and context has been fully maintained and enhanced by Heintze's annotations. In doing so Heintze has created a novel sort of edition, which she has labeled an "integrated edition of sources", in which "source" is not "text". It is still an edition because she uses only the author's own words and data. She is an editor, yes, but she is also more than an editor. [...] In the opinion of one who has struggled with the ethnographic literature about the area visited by Schachtzabel, Heintze's reconstruction is not just meritorious, but invaluable, and she should be praised for her decision to treat the materials as she did.